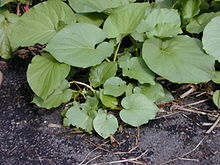 Piper auritum (Hoja santa) is an aromatic herb with a heart-shaped, velvety leaf which grows in tropic Mesoamerica. The name hoja santa means “sacred leaf” in Spanish. It is also known as yerba santa, hierba santa, Mexican pepperleaf, acuyo, tlanepa, anisillo, root beer plant, Vera Cruz pepper and sacred pepper. ^ a b Barlow, Prof. Snow (2003). “Sorting Piper names”. University of Melbourne. Retrieved 2007-03-29. ^ a b c d Miller, Mark Charles (1993). Coyote’s Pantry: Southwest Seasonings and at Home Flavoring Techniques. Ten Speed Press. p. 70. ISBN 0-89815-494-4. ^ a b c d e f g h i Katzer, Gernot (2012). “Gernot Katzer’s Spice Pages – Mexican Pepperleaf (Piper auritum Kunth)”. Retrieved 2012-12-03. ^ “Piper auritum“. Natural Resources Conservation Service PLANTS Database. USDA. Retrieved 6 October 2015. ^ a b “Ingredient – Hoja Santa”. The Washington Post. 2004-08-18. Retrieved 2007-03-29. ^ Raichlen, Steven (2000). Steven Raichlen’s Healthy Latin Cooking: 200 Sizzling Recipes from Mexico, Cuba, Caribbean, Brazil, and Beyond. Rodale Books. p. 26. ISBN 0-87596-498-2. ^ Lambert, Paula (2000). The Cheese Lover’s Cookbook and Guide: Over 150 Recipes with Instructions on How to Buy, Store, and Serve All Your Favorite Cheeses. Simon & Schuster. p. 43. ISBN 0-684-86318-9. ^ Hale, Adrian J.S. (2006-09-28). “Craft, not Kraft, is the key to these homeland treats”. Orlando Weekly. Archived from the original on 2006-11-14. Retrieved 2007-03-29. ^ Conner, Lori (2006). “El Restaurante Mexicano (May/June 2006): Beyond margaritas”. Maiden Name Press LLC. Retrieved 2007-04-01.